There’s no shortage of Israel news in English online these days, but finding the best ones that you can trust is a bit more challenging. At IsraelAM we get the Israel news for our daily email newsletter from a wide variety of reputable Hebrew and English Israeli and American news sources. In this blog post we’re going to let you in on the English Israel news sources we use. If you have the time and the desire, these Israel news sources in English are definitely worth checking out on a daily basis. Some of them are more to the left and some to the right, so you need to read a bunch of them from all sides to get a balanced view of the Israel news. We haven’t rated them or listed them in any particular order. But we have tried to give you some insight into their political leanings, writing style and ease of use. 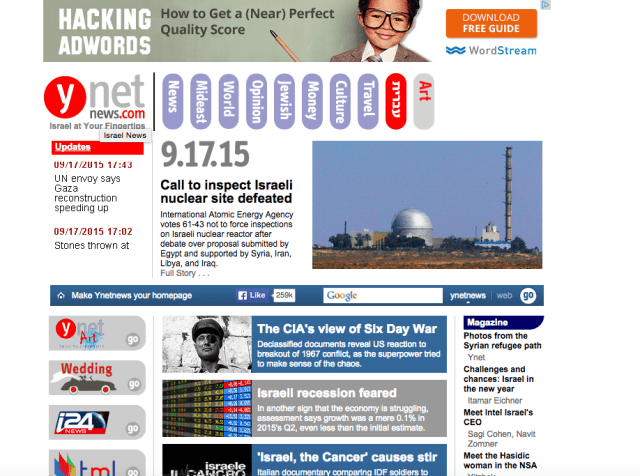 Haaretz.com is the English language site of Israel’s oldest daily newspaper. The Hebrew newspaper was founded in 1918 and is now published in both Hebrew and English in print and online. Haaretz’s political orientation leans left. You’ll find their articles to be critical of Israeli policies relating to the West Bank (which they consider to be occupied territory) and injustices directed against the Palestinians living there. The paper is also critical of Prime Minister Benjamin Netanyahu’s right leaning government, especially the right wing parties within it. Charedim and Orthodox Judaism don’t feel the love from Haaretz columnists either. But even if you can’t stand their politics, Haaretz is worth reading for their thorough and accurate news reporting and interesting feature stories. You’ll just have to filter out their biases. Most of the articles on Haaretz.com are translations of stories appearing on their Hebrew site www.haaretz.co.il. Those translations aren’t always 100% accurate or don’t fully capture the meaning of the original Hebrew. This most likely happens because the translators are sometimes just trying to translate word for word, which doesn’t always work from language to language. Some of the stories on the English language site are different than on the Hebrew site, especially if the stories relate to domestic issues which the editors feel non-Israelis will not be interested in. So if you’re interested and are a Hebrew reader, you should click on the link at the top of their homepage to check out the Hebrew site and see what the top stories are for the natives. The website doesn’t have nearly as many ads or annoying popups as some of the other Israel news sites, so getting the articles to load is relatively painless and won’t crash your computer. You probably will have to close a couple of ads to maintain your sanity, but I guess that’s par for the course. While most of the headline news articles are free, many of the features and articles that contain analysis require a premium subscription. It comes out to about $9 per month, but you really have to be a fan of the paper to pay, with so many other free options available. 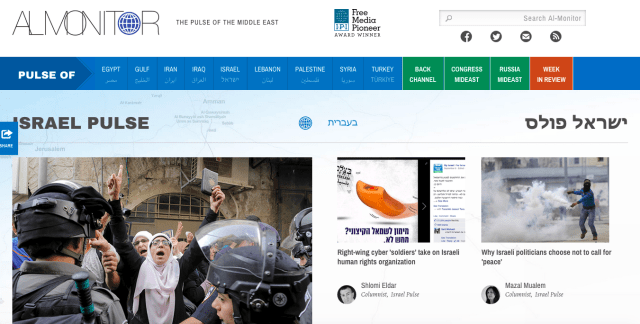 Jpost.com is the website for The Jerusalem Post, which was founded in 1932 as The Palestine Post. The Jerusalem Post is an English language newspaper with no Hebrew edition. Therefore, the articles don’t have the same problem of mistranslation from Hebrew like some of the other English language Israel news sites. Jpost’s political leanings are supposed to be centrist, but they tend to pull to the right. The paper/site has interesting features and analysis, some for free and some for paid subscribers only. The main problem with the website is that it has way too many ads and super annoying popups that significantly impact the site’s loading speed and make it almost unusable. I’ve repeatedly tried to use the site as a news source for our israelAM daily email, but I always find myself waiting ages for pages to load and my browser tends to slow down, which is totally unacceptable to me. So I end up just closing the pages and moving on. Maybe it’s just me or my computer, so you should try it for yourself and see how it goes for you. It’s worth a shot. Ynetnews.com is the online English-language Israeli news website of Yedioth Ahronoth, Israel’s most-read newspaper, and the Hebrew news portal, Ynet. The Hebrew print edition is considered to be the newspaper of record in Israel and its reporting is fairly balanced. The stories on the English language website are often about half a day behind the Hebrew website, so if you really want to stay current, you better brush up on your Hebrew. Since it’s a translation, the Ynetnews stories are sometimes lacking in grammar and completeness relative to the Hebrew versions, but you’ll still get the basic news from an Israeli perspective. The site is totally free, but chock full of adds and popups that slow it down. But it’s not nearly as bad as jpost.com. Israel HaYom (Hebrew: ישראל היום‎, lit. “Israel Today”) is an Israeli Hebrew-language free daily newspaper, first published in 2007. 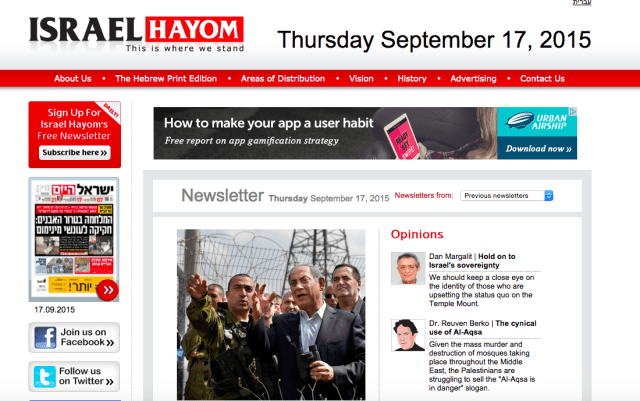 Israel HaYom has the largest daily circulation in the country. The newspaper is owned by US casino mogul Sheldon Adelson who is a big supporter of Prime Minister Netanyahu. Therefore, the paper is clearly biased in favor of Netanyahu and chooses to play down events that don’t help to promote a positive image for Netanyahu, while on the other hand, touting and inflating events that help promote him and the Likud. The English language website is basically a newsletter with the news that appeared in the Hebrew language version the day before. So you’re basically getting day old news. But you’ll still find interesting stories and analysis which you won’t find elsewhere, so it’s worth a look. The site is totally free. If you want to be brave, you can also read the digital version of the Hebrew print addition online, which is really pretty cool. Al-Monitor (media site) features reporting and analysis by journalists and experts from the Middle East, with special focus sections (that Al-Monitor terms “pulses”) on Egypt, the Persian Gulf, Iran, Iraq, Israel, Lebanon, Palestine, Syria and Turkey. The Israel section of Al Monitor is heavily left leaning and pro-Palestinian. If you want the extreme left version of events, this is a good place to get it. Arutz 7 literally means channel seven, which was the call signal for the independent, pro-settlement radio station. The actual station no longer is active, but Arutz 7 has a Hebrew and English news site. The English one is a www.israelnationalnews.com. It’s right wing, pro-settlement and a bit reactionary, but if that’s your cup of tea, it’s a great site to get your Israel news from. If you’re looking for the Jewish perspective of a recent incident on the Temple Mount or an attack on Jewish settlers, you’ll find it here (and possible nowhere else in English). The actual website has lots of ads and can get slow. But it’s manageable. The Jewish Telegraphic Agency (JTA) is an international news agency and wire service serving Jewish community newspapers and media around the world. It’s not-for-profit, with no political or philosophical leanings. 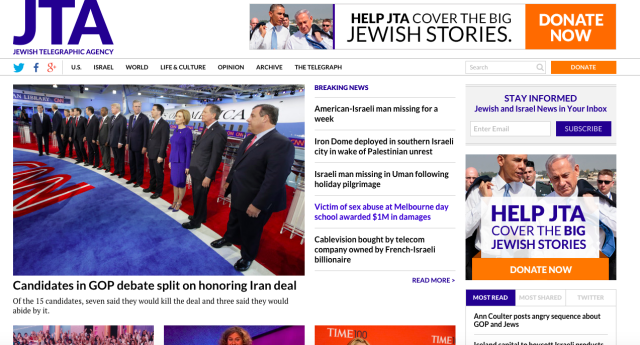 JTA.org has Jewish news from all over the world, but if you just want Israel news you can get it by clicking on the “Israel” link on the homepage. It’s a great source for unbiased and concise reporting. And there are no ads or popups, so the site loads quickly and painlessly. Globes.com is the English language version of one of the premier Israeli business news publications. It’s a bit behind its Hebrew language version, but it’s still the best source for everything business and economy related in Israel. There are sections on real estate, technology and startups, just to name a few. Want to know which Israeli company just got purchased by Google or Microsoft? You’ll find the answer in Globes. The site is fast, for the most part, with few ads. 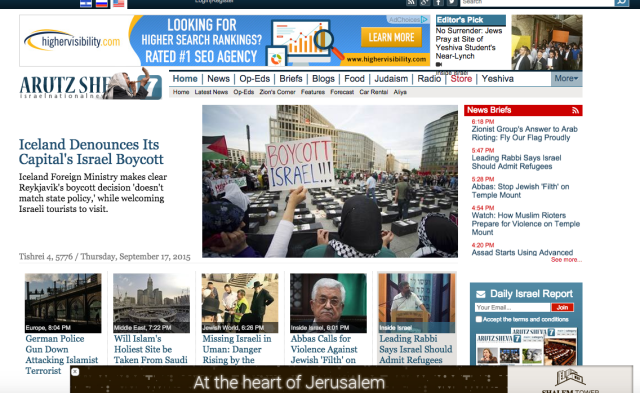 One of the two major world newswire service, you can’t go without heading to the site and searching for Israel news. Many of the Israeli papers get stories from here, so you might as well read it in the original. The other major world newswire service. Check out what we just wrote for the Associated Press. Of course there are other general news sites like CNN, Fox News, NYTimes, The Wall Street Journal and many more that will contain some news about Israel, depending on the day and events. But if you want your daily dose of Israel news in English, on a regular basis, the 10 sites we listed are good bets to check out. Of course, if you don’t have time to spend reading all of those articles, you can subscribe to our israelAM daily email newsletter and get the Israel news you need to know directly in your inbox every morning.